DNA technology has a vital role in diverse fields such as criminal investigation and gene therapy – dynamic areas involving many specialised terms and techniques. This unique dictionary offers current, detailed, accessible information to lecturers, researchers, students and technicians throughout the biomedical and related sciences. The new edition represents a major update with 50% more entries on the very latest developments. Clear explanations of terms, techniques, and tests, including commercial systems, with detailed coverage of many important procedures and methods. Includes well-established methodology plus new technology and data from the latest research journals, going well beyond the remit of most science dictionaries. Essay-style entries on many major topics to assist newcomers to the field. Covers topics relevant to medicine (diagnosis and gene therapy); veterinary science; biotechnology; biochemistry; pharmaceutical science/drug development; molecular biology; microbiology; epidemiology; genomics; environmental science; plant science/agriculture; taxonomy; and forensic science. 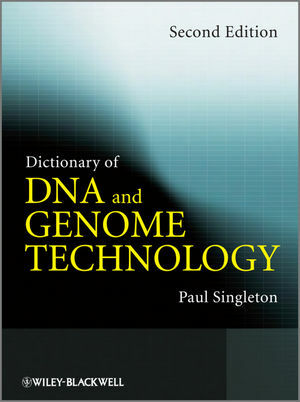 For more than 30 years Paul Singleton has been an independent writer and editor in biomedical science. His works include DNA Methods in Clinical Microbiology; Dictionary of Microbiology and Molecular Biology; Bacteria in Biology, Biotechnology and Medicine; and Antimicrobial Drug Action. Appendix: alphabetical list of general.